Ambulatory blood pressure monitoring (ABPM) is a method of taking regular blood pressure readings of patients, usually over a 24-hour period, as patients conduct their normal activities. A special blood pressure monitor is used, and patients are asked to keep a diary or log of their activities during the day. Hypertension: Higher than normal blood pressure (the force, or tension, of the blood in the walls of the arteries). Hypertension can contribute to coronary artery disease, heart attack and stroke. Most patients with blood pressure disorders will not need ABPM. However, some signs and symptoms generally lead to the use of ABPM to confirm or eliminate a diagnosis. In addition, ABPM has been found to be a more accurate predictor of patients at high risk of a cardiac event than more casual methods. Home blood pressure monitoring systems are gaining in popularity. Such systems allow patients to self-test their blood pressure readings as often as desired. It is important to note, however, ABPM is not the same as simply having and using a home blood pressure monitoring system. ABPM is a specific process of ?round-the-clock? blood pressure monitoring in combination with a written log that is used to aid in the diagnosis and/or treatment of blood pressure related conditions. An arterial switch operation is a surgery used to treat a congenital heart defect called transposition of the great arteries (TGA). TGA is a birth defect in which the heart is basically wired backwards, with the two main arteries (the aorta and the pulmonary artery) connected to the wrong sides of the heart. As a result of this misplacement, Congenital Heart Disease: A heart abnormality, defect or malformation that is present from birth. oxygen-rich blood from the lungs is sent back to the lungs, and oxygen-poor blood from the body is sent back to the body. Due to this defect, the body does not receive enough oxygen-rich blood. The most common symptom is a bluish tinge in the skin, lips, fingernails and other part of the body (blue baby). 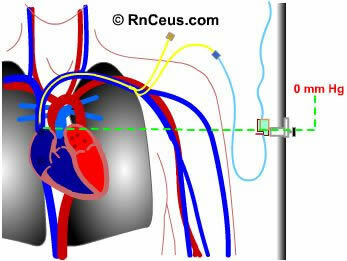 During an arterial switch operation, the two misconnected arteries are moved to the correct locations. 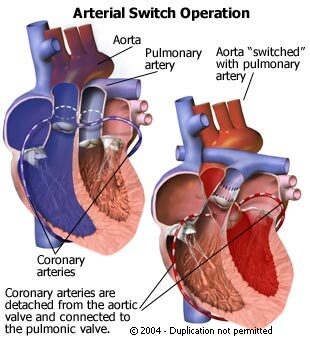 The arterial switch operation is an open-heart surgery that carries a slightly greater risk of complications than the surgery formerly done most commonly to treat TGA: the intraatrial baffle. To reduce the risk of complications, people are urged to find a pediatric heart surgeon with extensive experience in performing this surgery. The arterial switch operation also offers greater potential life expectancy than any other treatment for TGA that has been developed to date. If patients follow up with their cardiologist regularly, and take antibiotics before any dental, medical or surgical procedures, then they can generally expect to live longer than if they had undergone the intraatrial baffle. A vessel that carries blood high in oxygen content away from the heart to the farthest reaches of the body. Since blood in arteries is usually full of oxygen, the hemoglobin in the red blood cells is oxygenated. The resultant form of hemoglobin (oxyhemoglobin) is what makes arterial blood look bright red. By contrast, a vein is a blood vessel that carries blood low in oxygen content from the body back to the heart. The deoxygenated form of hemoglobin (deoxyhemoglobin) in venous blood makes it appear dark. Veins are part of the afferent wing of the circulatory system which returns blood to the heart. 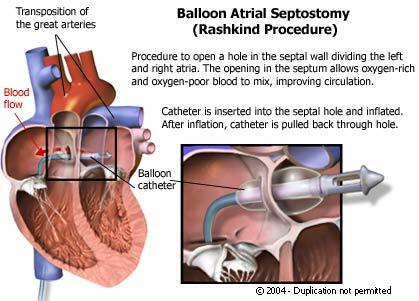 Also known as the Rashkind procedure, a balloon atrial septostomy is a catheter-based procedure that widens an existing hole in the wall (septum) between the two upper chambers of the heart (atria). This hole is called an atrial septal defect (ASD). By widening the defect, oxygen-rich and oxygen-poor blood are allowed to mix more freely. Under normal circumstances, oxygen-rich and oxygen-poor blood should not mix. However, babies born with certain heart defects do not receive enough oxygen-rich blood. As a result, the infant tends to have a bluish tint (cyanosis) to the skin, lips, fingernails and other parts of the body. This condition is often called blue baby. A successful balloon atrial septostomy is a nonsurgical procedure that widens the ASD in order to improve circulation until all the heart defects present can be surgically repaired. As a result of the balloon atrial septostomy, the baby?s color returns to a more natural, healthier tone. A pioneering heart operation named after the American surgeon Alfred Blalock (1899-1964) and the pediatric cardiologist Helen B. Taussig (1898-1986). Dr. Taussig designed and Dr. Blalock carried out the first “blue-baby” operation to treat a child born with a previously inoperable heart malformation (tetralogy of Fallot). The procedure joined an artery leaving the heart to an artery leading to the lungs to give the blood a second chance at oxygenation. The joining (anastomosis) was of the subclavian artery to the pulmonary artery. It was the first blue baby operation and came to be known as the Blalock-Taussig shunt. This operation, which was first done on November 29, 1944 at the Johns Hopkins Hospital in Baltimore, is a major landmark in the history of children’s heart surgery. Also known as the ?blue baby operation,? the Blalock-Taussig procedure is a surgery in which a detour (shunt) is created from the aorta to the pulmonary artery. The surgery is performed on infants and young children who are born with a congenital heart defect that reduces the amount of oxygen-rich blood circulating in the body. These infants often show signs such as a bluish tint (cyanosis) to the skin, lips, fingernails and other parts of the body. The Blalock-Taussig procedure is performed as a temporary solution. In other words, it will improve the immediate signs and symptoms of the underlying Blalock-Taussig Procedure heart defect, but not correct it. Other surgeries are usually necessary in the future to repair the defect itself. The surgery involves an incision in the chest, but it is not an open-heart surgery. and does not use the heart-lung machine. Parents can expect their infant to remain in the hospital for about three to six days after the surgery. Parents are also encouraged to discuss with a pediatric cardiologist and heart surgeon all benefits and risks associated with this procedure. In most cases, the benefits greatly outweigh the risks. 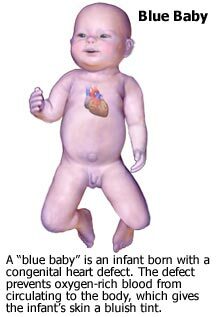 A blue baby is an infant born with a type of congenital heart disease that causes the infant?s skin to have a bluish tint (cyanosis). Cyanosis develops when the tissues and organs of the body do not receive enough oxygen. This, in turn, is caused when much Congenital Heart Disease: A heart abnormality, defect or malformation that is present from birth. of the blood circulating through the body is ?blue? (or oxygen-poor) rather than ?red? (or oxygen-rich) to nourish the baby?s tissues. Many different heart defects can cause this condition. Although a blue baby once had very little chance of survival, treatments are now available to help blue babies grow up to live normal, healthy lives. Depending on the specific heart defect that is causing the condition, treatment could involve medications, a minimally invasive procedure called cardiac catheterization or surgery. 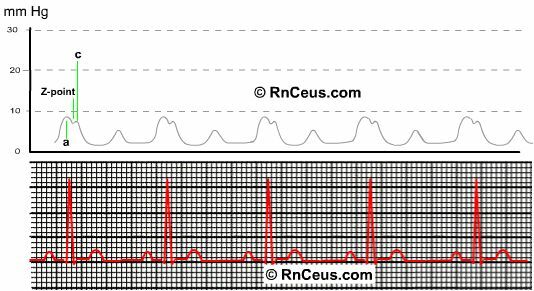 Central venous pressure is considered a direct measurement of the blood pressure in the right atrium and vena cava. It is acquired by threading a central venous catheter (subclavian double lumen central line shown) into any of several large veins. It is threaded so that the tip of the catheter rests in the lower third of the superior vena cava. The pressure monitoring assembly is attached to the distal port of a multilumen central vein catheter. Also known simply as an ?echo,? 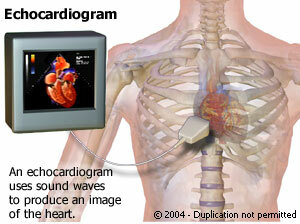 an echocardiogram of the heart?s chambers and valves is called a transthoracic echocardiogram. The word ?transthoracic? means ?across the chest.? It is a painless test that is very similar to an x-ray but without the radiation. Instead of using x-rays, it uses high-frequency sound waves (ultrasound) to get a picture of the four heart chambers and the four heart valves. The sound waves bounce back from the heart chambers and valves, producing images and sounds that can be used by the physician to detect damage and disease. Because it does not involve any of the radiation that an x-ray does, it is a very safe test. In fact, it uses the same technology that is used to evaluate a baby?s health before birth. To perform a transthoracic echocardiogram, a special gel is placed on the chest over the area being examined. A small device (transducer) is then moved over the gelled area and images can be seen immediately on a video monitor. * One-dimensional, two-dimensional, or three-dimensional echocardiograms. Produce detailed images of the heart. * Doppler ultrasound. Measures the speed (velocity) with which blood is traveling through the heart. * Stress echocardiogram. Measures the wall motion of the heart?s pumping chamber before and immediately after exercise (on a treadmill or stationary bicycle). * Chemical stress echocardiogram. Measures the wall motion of the heart?s pumping chamber using a drug that causes the heart to react as if the person were exercising. * Transesophageal echocardiogram (TEE). Produces clear images of the heart structures and valves, without the interference of the chest wall and lungs. A transducer is placed down the patient?s throat, into the esophagus. * Intravascular echocardiogram. Produces clear images of plaque and calcium deposits on the inside of a blood vessel. A transducer is placed inside the blood vessel. 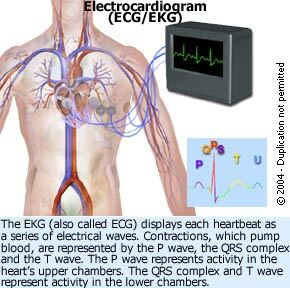 An electrocardiogram (EKG or ECG) is a recording of the heart?s electrical activity as a graph or series of wave lines on a moving strip of paper. This gives the physician important information about the heart. For example, it can show the heart?s rate and rhythm. It can also detect decreased blood flow (cardiac ischemia), enlargement (hypertrophy) of the heart or the presence of either current or past heart attacks. EKGs are noninvasive, quick, safe, painless and inexpensive tests that are routinely done if a heart condition is suspected. Depending on what the results show, in combination with the patient?s medical history and a physical exam, the physician may order further tests or a combination of medications and lifestyle changes. Patients may receive an EKG as part of a physical exam in a hospital, clinic or doctor?s office, but the test can be performed almost anywhere. The number of heart beats per unit time, usually per minute. The heart rate is based on the number of contractions of the ventricles (the lower chambers of the heart). The heart rate may be too fast (tachycardia) or too slow (bradycardia). The pulse is bulge of an artery from the wave of blood coursing through the blood vessel as a result of the heartbeat. The pulse is often taken at the wrist to estimate the heart rate. Pertaining to the newborn period which, by convention, is the first four weeks after birth. When oxygen is carried in the blood, it is bound to a substance called hemoglobin in red blood cells. Hemoglobin has several places where oxygen can bind to it. Oxygen saturation is the percentage of places on hemoglobin where oxygen is attached. If oxygen saturation is less than 90% for long periods of time, it can cause health problems. One of the two vessels, which are formed as terminal branches of the pulmonary trunk and convey unaerated blood to the lungs. The two pulmonary arteries differ in length and anatomy. The right pulmonary artery is the longer of the two. It passes transversely across the midline in the upper chest and passes below the aortic arch to enter the hilum of the right lung as part of its root. 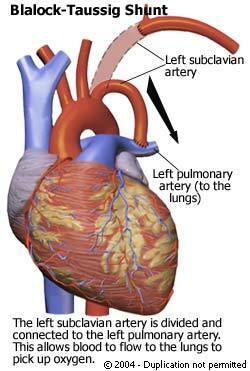 The left pulmonary artery is the shorter of the two terminal branches of the pulmonary trunk. It pierces the pericardium (the sac around the heart) and enters the hilum of the left lung. The number of breaths per minute or, more formally, the number of movements indicative of inspiration and expiration per unit time. In practice, the respiratory rate is usually determined by counting the number of times the chest rises or falls per minute. By whatever means, the aim is to determine if the respirations are normal, abnormally fast (tachypnea), abnormally slow (bradypnea), or nonexistent (apnea). 1) To move a body fluid, such as cerebrospinal fluid, from one place to another. 2) A catheter (tube) that carries cerebrospinal fluid from a ventricle in the brain to another area of the body. A shunt may be placed to relieve pressure from hydrocephalus, for example. 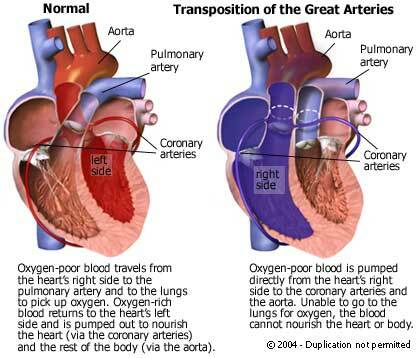 Transposition of the great arteries (TGA) is a type of heart defect in which the two great arteries (the pulmonary artery and the aorta) are in reversed (transposed) locations. This reverses circulation in the heart. Normally, oxygen-rich blood travels through the aorta to nourish the cells and tissues, while oxygen-poor blood travels through the pulmonary artery on its way to the lungs for fresh oxygen. By contrast, TGA results in two kinds of parallel circulation. Oxygen-poor blood from the body is pumped back out to the body through the aorta, while oxygen-rich blood is pumped back to the lungs through the pulmonary artery. Survival depends on the presence of other heart defects that allow some mixing of oxygen-rich and oxygen poor blood. Even with other defects, however, the baby will likely not be getting sufficient oxygen from the blood. As a result, the infant will often be born with a bluish tone to the skin, lips, nails and other parts of the body (blue baby). The other defects that might be present with TFA include a hole in the muscular wall between the heart?s upper chambers (an atrial septal defect) or a hole in the wall between the lower chambers (a ventricular septal defect). Alternatively, the young patient may be born with a patent ductus arteriosus ? a condition in which the prenatal channel between the aorta and the pulmonary artery (ductus arteriosus) remains open (patent) at birth. To correct any heart-associated defects, surgery is generally performed in the early days following birth.